If you want to see how corporate education reform found its way in to the New York public education system, check out this video of educator and activist Brian Jones. Brian Jones is also behind the making of the film The Inconvenient Truth Behind Waiting for Superman. So why is this important to Oregonians? Because corporate education reform is here now too. Let's learn what not to do by paying attention to our East Coast schools, teachers, and parents who want something better. And for the record, so do we. 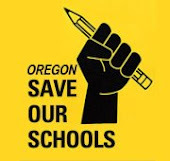 I just have to thank Oregon Save Our Schools for stepping up and asking the right questions regarding the education reform decisions that are coming full-speed ahead by the Governor's office. This document is a must read for anyone who is concerned about the direction of public education here in Oregon. A lot of damage may be done is this short legislative session, and it is important to read of these concerns and to contact your legislators now and ask questions--demand better. Also, if you have time, come join us at the Strong School Strong Oregon rally this Monday at the Capitol steps in Salem.